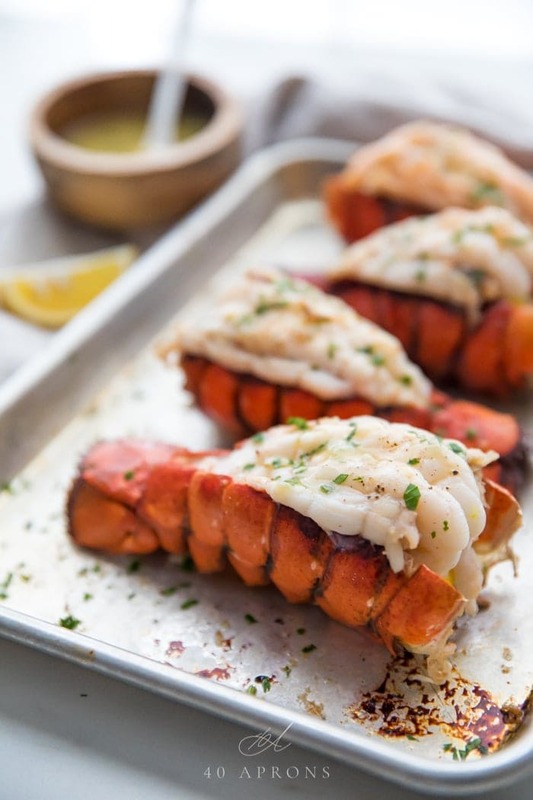 This recipe for how to broil lobster tails is surprisingly easy and results in a show-stopping, flavorful broiled lobster with a delicious garlic butter sauce. Perfect for Valentine’s Day, company, date night, and with paleo or Whole30 options! Does any food say luxury quite like lobster? OK, so maybe that $700 jar of caviar screams it, but to me? Lobster is synonymous with special dinners, like Valentine’s Day or a meaningful anniversary (But probably not that year 2 anniversary). In my oh so humble opinion, though, we do not eat nearly enough lobster. And sure, eating lobster out at a restaurant can be super expensive! So make it at home: problem solved. Except how intimidating do these lobster tails look? 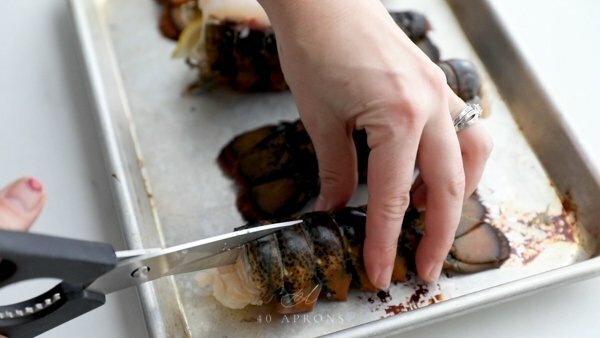 I always used to feel like I would overcook them, and I certainly never knew how to butterfly lobster tails. So I usually skipped it, or haphazardly steamed a tail before ripping out the meat to throw into an over-the-top mac-and-cheese for my hubby. I’m a changed woman. Why? I learned how to broil lobster tails and how to butterfly lobster tails and this garlic butter sauce? Oh, oh oh. But that’s not all. It’s not just learning how to broil lobster tails and how to butterfly lobster tails. 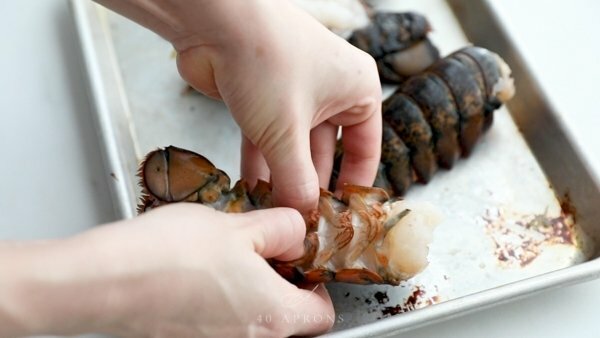 It’s how to broil lobster tails perfectly and how to butterfly lobster tails easily. Especially on nights like Valentine’s Day, the last thing I want to be doing is a) ruining a relatively costly piece of seafood or b) spending all day in the kitchen to prepare. No rubbery, overcooked lobster, no intensive methods, no bland shellfish. 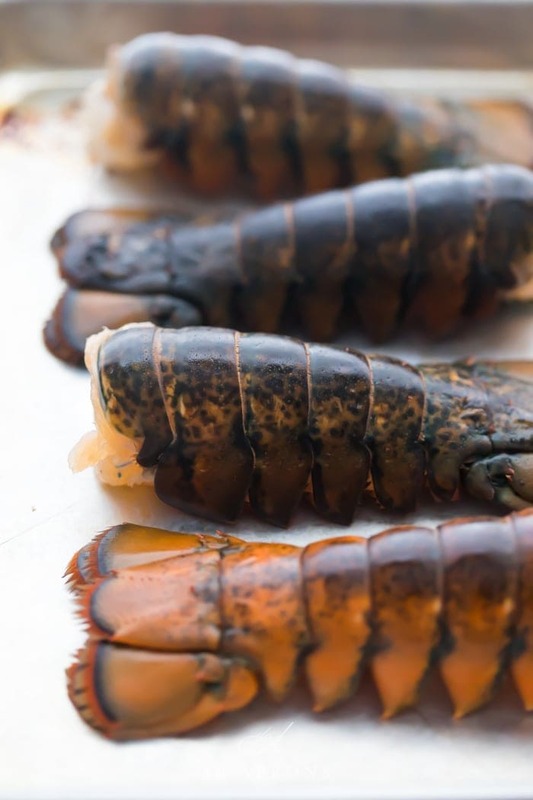 If I’m going to share my method for how to broil lobster tails, it’s got to be just right. And voilà, friends. VWAH-LAH. 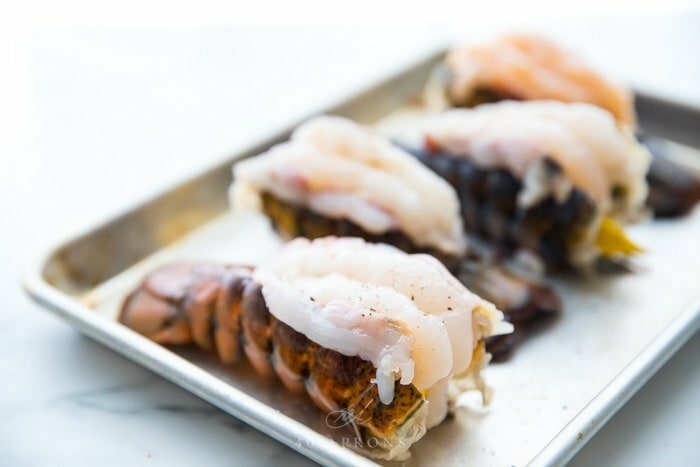 There are a few simple steps when it comes to learning how to broil lobster tails and doing it damn well. Butterfly the lobster tails: This is a fancy way of saying cut the shells open (down the middle), loosening the tail meat from the shell but leaving it attached in the fin, and then laying it back down on top of the shell. I like to lay lemon wedges in between the shell and the lobster meat to really keep the butterflied tails nice and beautifully high, and it adds a great pop of citrus to the meat, too. Season the butterflied lobster tails with plenty of salt and a bit of fresh cracked pepper. Preheat your broiler and move your oven rack so the top rack is approximately 8-9″ from the heat source. 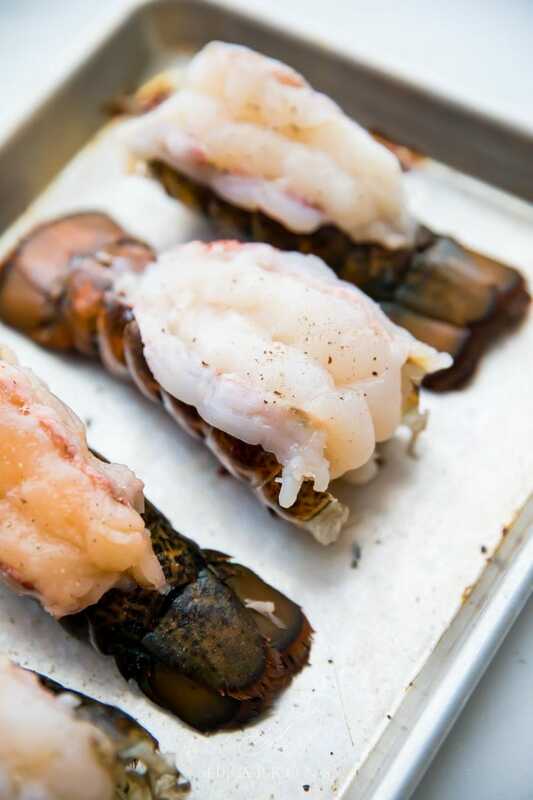 Broil your lobster tails so that the tops of the tails are about 6″ from the broiler. Broil until the meat is white and opaque. This will take about 5-10 minutes. Keep an eye on them and don’t overcook! Remove from the oven and serve with plenty of garlic butter dipping sauce. Well, it’s all about looks, really. Butterflying lobster tails makes them so stunning, and it makes them easier to eat, too. 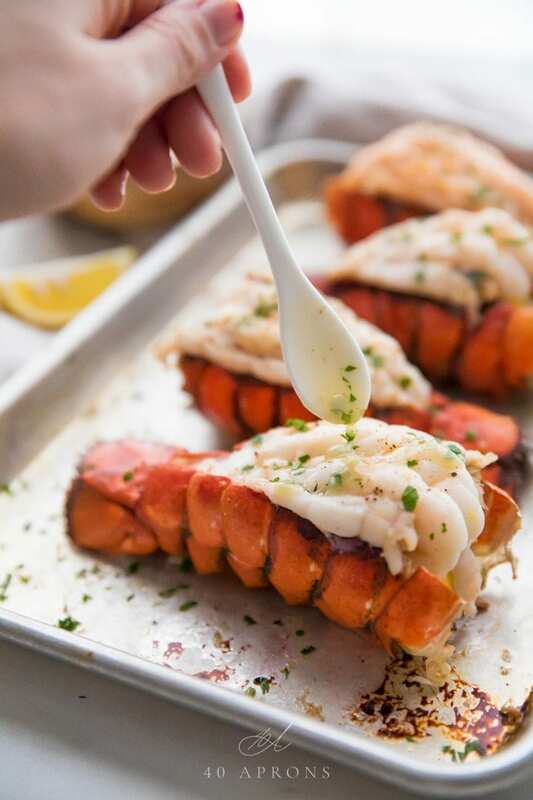 But technically, you’ll have a slightly more flavorful broiled lobster tail if you leave the meat in the shell; the shell provides flavor and moisture for cooking that you won’t get if you prop the meat up on top of the shell. You can absolutely cook these either way, either butterflied or with the shell cut down the middle but the meat still inside, but it might take a minute longer until the meat is white and opaque if you cook it still in the shell. Now, how to butterfly lobster tails. It’s really simple, although it looks a bit complicated. Start by flipping the tails over and, with your thumbs, break the ribs in between the swimmerets by pressing down pretty hard (Yep… the little leg-fins are called swimmerets. I’ll stop now, because you’ll start thinking lobsters are too damn cute to eat.). This helps loosen the meat. Flip the tail over and, with a pair of kitchen shears, cut down the middle of the shell and the top of the meat all the way to the fin. Don’t cut through the fin. You can cut the tail or break the ribs first – the order does not matter. Next, at the opening (Where the tail met the body) carefully stick your finger in between the meat and the shell and loosen the meat from the shell. You’ll probably break several membranes. No stress. Once the meat is loose from the shell (But still attached to the fin), lift the meat up and lay back down on the top of the shell. Place lemon wedges underneath the meat for more flavor and a stronger butterfly lift. Butterfly your lobster tails as detailed above. Season the lobster tail meat with lots of salt and a bit of freshly cracked pepper. Slice 4 tablespoons (1/4 cup) of unsalted butter into 8 pieces (1/2 tablespoon each) and place 2 on each tail. Preheat your broiler and place top over rack about 8-9″ from broiler. Broil about 6″ from heat source about 5-10 minutes or until meat is white and opaque. Keep an eye on them and don’t overcook. Remove from oven and transfer to a plate; set baking sheet aside but do not drain. Make your garlic butter sauce: In a small saucepan, melt 2 tablespoons butter over medium-low heat. Add the minced garlic and cook until fragrant, about 30 seconds, stirring constantly. Stir in lemon juice and a pinch of salt, then stir in melted butter and drippings from the baking sheet. Whisk well, then taste and correct seasonings. Add more salt or lemon juice to taste. 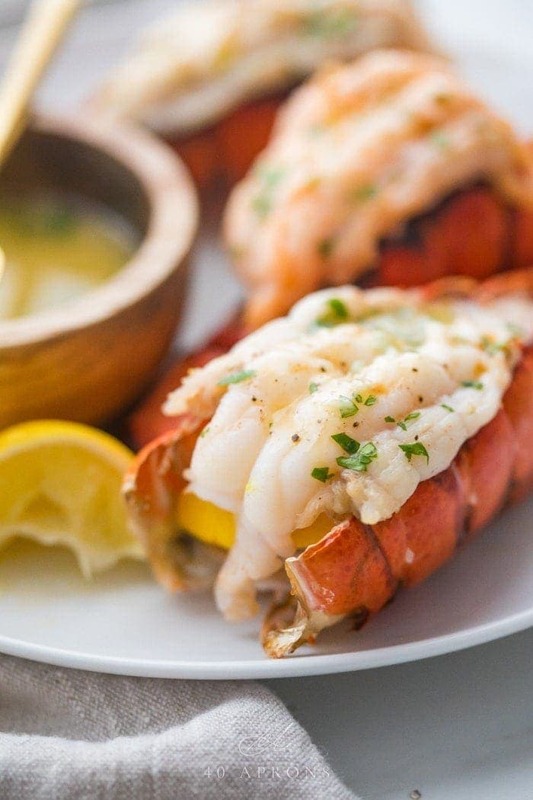 Drizzle a bit of garlic butter sauce over lobster tails and serve with more for dipping. 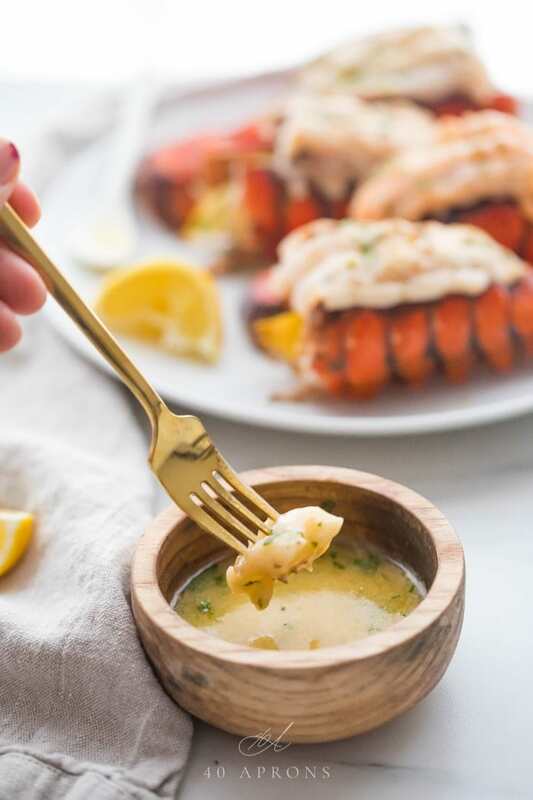 A simple but perfect and flavorful method for how to broil lobster tails and a garlicky, lemony butter dipping sauce to serve. Butterfly the lobster tails: Flip lobster tails upside down. Crack the ribs on the underside of the tail with thumbs. Turn over so brown shell is on top. With kitchen shears, cut down the shell and through the top portion of the meat down to the fin, without cutting through the fin. Slide your finger in between the meat and shell at the opening and loosen meat from shell on both sides, breaking membranes if necessary. Pull meat loose from sides of shell without detaching from the fin. Do this carefully, as the shells can be pretty sharp! Place two lemon wedges underneath meat and place meat back down on top of shell. Repeat for remaining lobster tails. Place on a small baking sheet. Preheat broiler and move your oven rack to about 8-9" below heat source. Cut 4 tablespoons of butter into 8 pats (Reserve remaining 2 tablespoons for garlic butter sauce). 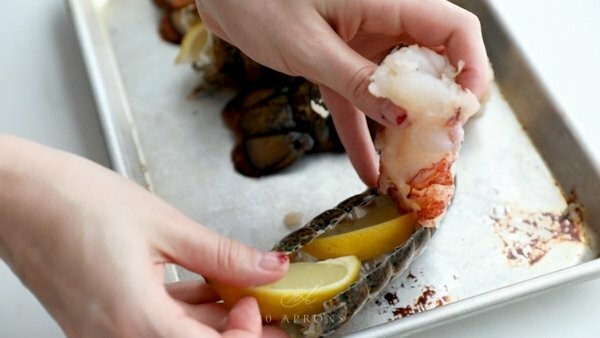 Sprinkle lobster tails with salt and pepper, then place 2 pats of butter on the top of the lobster tail meat. Broil, about 6" from heat source, for 5-10 minutes or until white and opaque. Keep an eye on them; peek if necessary. Don't overcook! See note 1. Right when meat turns opaque and firm, remove from boiler and use tongs to transfer to a plate. Meanwhile, heat 2 tablespoons butter in a small saucepan over medium-low heat. Add garlic and sauté until fragrant, about 30 seconds, stirring constantly. Add 1 teaspoon of lemon juice. Pour in drippings and melted butter from the baking sheet and whisk well. Season with a pinch of salt and taste; add more salt or lemon juice to taste. Drizzle over lobster tails and serve with additional garlic butter sauce for dipping. Garnish with fresh chopped parsley if desired. 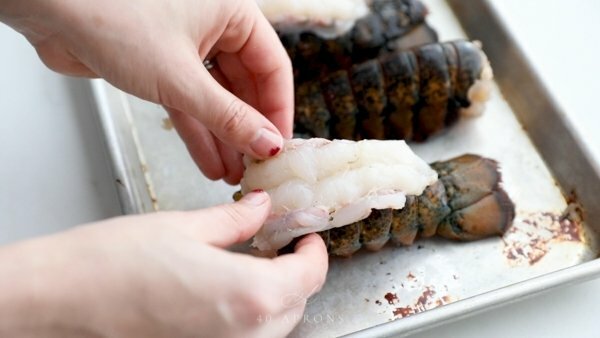 Smaller or larger lobster tails will take less or more time to cook. Factor in about 5 minutes for a small lobster tail and 10-15 minutes for very large lobster tails. Keep an eye on them as they broil and remove from the oven when the meat turns white and opaque. For a Whole30 version, use 2 tablespoons ghee instead of butter in the sauce. 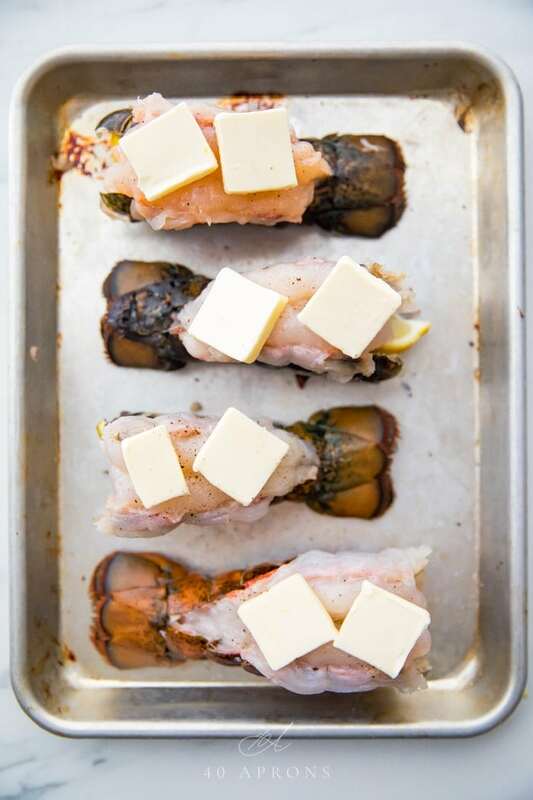 Dot butterflied lobster tails with two 1/2 tablespoon dollops of ghee before broiling. This works best with a very firm and smooth ghee like 4th & Heart. 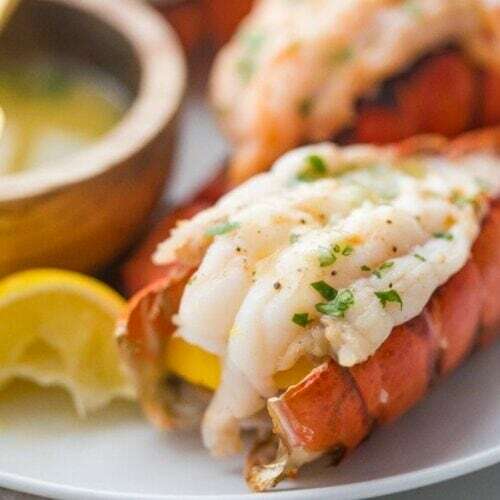 For a dairy-free version, use a dairy-free "butter" in place of the butter in both seasoning the lobster tails and in the garlic butter sauce.